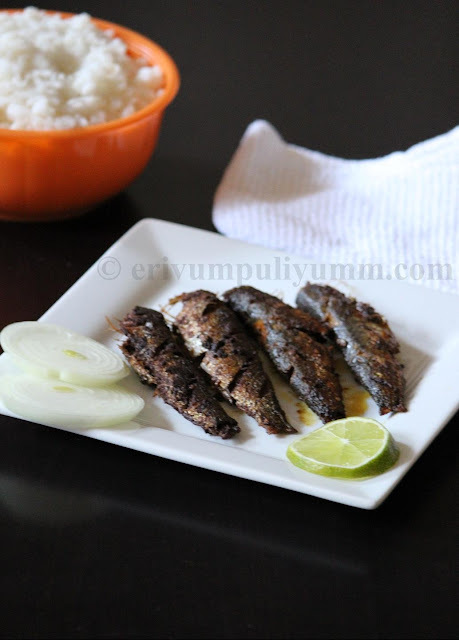 Sardine fry/ Mathi Varuthathu,a common menu entity in our place in Kerala and a popular one.I love this sardine fry very much compared to other smaller fish fries.I think many other Keralites would agree with me too though it leaves a strong odour when cleaned & fried.Earlier this fish was a common man's fish or a poor man's fish as it was very cheap but these days sardine fish prices have also gone high.Anyways,that apart from the recipe,this is a very simple delicious fry.Do check this out & enjoy !! -Drain all water,Take the other ingredients in a bowl except fish and oil make a smooth paste adding few drops of water. -Gently rub the paste all over the fish and leave for marination for 3/4-1 hour. -Fry the fish one side,turn and fry both sides evenly.Drain on a paper towel to avoid excess oil. -Serve hot with steamed rice !! * Please modify the spices according to your tolerance levels. * If you wish to add flavors,then you can add a tsp of ginger-garlic paste too though I haven't used that. Yumm,super crispy sardine fry,just love it. 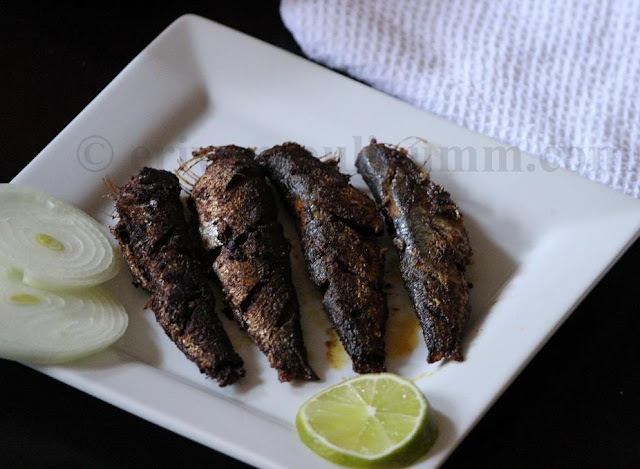 Simple & tasty delicious fish fry. 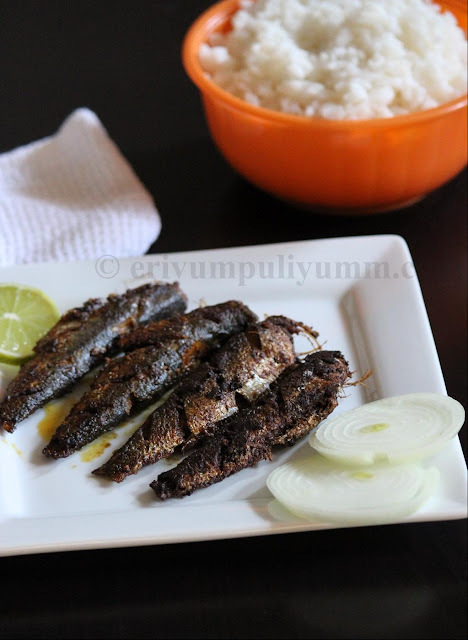 Tempting and delicious fish fry.. My mom used to make it.. Perfectly fried and it looks soo crispy dear..
delicious chala fry.i like fried chala than curried one. me too did yesterday. Very tempting fish recipe. Never tried that curry leaf technique. Sounds interesting !! This is nice with few ingredients. If will discuss price rate of everything we have to make separate post for it ;) right? great curry leaf tip, although how long should i fry each side please? My mom and I prepare it the same way Julie.. Love it with sambar and dal, also with curd...Yum!!! hi julie, how are you. i am back after my parents health improved and my net connection ok. These are lovely cuties..mouth watering.. I have awarded you One Lovely Blog award at my space. love this fish taste.. but scared of its mullu..